When you consider the best window air conditioner for use in your home, many factors need to be checked out. Features, quality, and price (value) are the most obvious. You also have to carefully determine the accurate cooling capacity for the size space you want to cool as well as any special installation requirements. Don’t worry, it’s not as daunting as it seems. The information below covers how to choose and what to expect from the best window A/C for your needs as well as a comparison and review for some of the most highly regarded brands and models. This will help you make a smart buying decision so you can rest easy as you enjoy cooler rooms in your home. 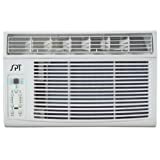 The following reviews highlight three of the most popular manufacturers of window AC units (Frigidaire, SPT – Sunpentown International, and Sharp). With the three brands examined above, you really can’t go wrong. In all, they each offer equivalent features and performance. Where they differ is in the details. If want something that looks great, go for a Frigidaire or Sharp model. If you need a larger capacity, SPT has the extended line. In the end, Frigidaire may be your best bet simply because of value and popularity. If something is sold to many more people, you’re in a good position – it tells you what most buyers just like you are regarding as the best window air conditioner for them. For value, the 10,000BTU Frigidaire model is your best choice (unless you have a smaller space to cool, e.g. 10’x10′ room or so. If your size requirements put you on the line, spend a little extra for the 10,000BTU model. Cooling up to 500 sq. ft., it can bring down the temperature of a house or level much greater than that size or cool smaller spaces much more quickly and run less, saving energy and lasting much longer over time. Buying on Amazon is nice because of the free shipping for most models. You’ll receive your unit in under a week, which is good if you’re anticipating a heat wave and need a good room A/C. When buying any model, measure the actual dimensions of your window first then compare to listed measurements of the unit you’re considering. Note that most units under-list the dimensions. Plan on anywhere from 1/2″-1″ offset and allow for extra width and height. 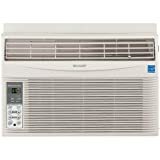 Models are rated by BTU to cool up to specific room sizes. You can reasonably expect that the unit will go beyond this size provided temperatures are not extreme, e.g. above 95-100 degrees. This means places like adjoining rooms or hallways can benefit from a good room air conditioner. Good energy efficiency, including Energy Star compliance or modes to help regulate the compressor going on/off. Various controls with stepped settings such as temperature, fan speeds, fan modes, timers, etc. Multiple running modes such as Cool, Econo or fan only operation. Well-lit displays to easier read things like actual temp reading or timer count-downs. 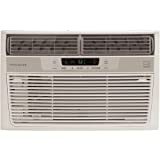 The best window air conditioner models will have air cleaners on them such as an ionizer or hepa filter. Included installation kits will have a good manual with various foam pieces and self-adhesive weather stripping to help seal the unit. Warranties for both the A/C unit and the compressor. The best room air conditioners will have an EER number of 9 or higher. All this means, is the amount of electrical energy needed to run it is not as demanding as it could be. It is determined by dividing the unit’s capacity (BTUs) per hour by the numger of watts of electrical energy needed to run it. The rub is that in order to gain higher EER ratings, manufacturers have add things like lighter fins in the heat exchanger. Since space is very tight in this area, it’s easy for dust and grime to collect here. Unfortunately, this area is not easily cleaned – a good vacuuming is about all you can do. Over time, the extra “stuff” on the fins can reduce the efficiency of even the best window air conditioner. This truly isn’t a big deal, but something to keep in mind as you expand your knowledge of these appliances.